Extensions are optional add-ons to iOS that can bring additional features from third party apps into the broader iOS Share Sheet menus. Extensions can allow for a wide range of tasks, including interacting with apps, sharing to specific services, photo editing features, uploading, and quite a bit more, and once enabled, they’re easily accessible from Share Sheets found throughout iOS in places like Photos or Safari. In this walkthrough we’re going to show you how to enable an extension in Photos app on an iPhone or iPad, but the process would be the same for Safari and other Share Sheet extensions too. Because Extensions come from third party apps, you won’t find them enabled by default, and even if you download one of the apps with an included extension, it won’t be turned on by default either. Because of this, many users don’t even know this nifty feature exists in iOS. Enabling and disabling Extensions is done much modifying the social sharing options in iOS Share Sheets. In this example, we’ll enable a Photos Extension from Skitch for iOS, a free app that lets you mark up images with text, shapes, and arrows. Many other apps have extensions as well, so just keep an eye out for a mention of it in an apps description or release notes. You’ll need a modern version of iOS to have Extensions support, as older versions do not support the feature. You can also rearrange how Extensions appear in the iOS Share Sheet menu by dragging the them around when in the “More” screen. You’ll find the newly enabled extension accessible in the same Share Sheet, and to use it you’ll simply open the Share Sheet and tap on the extension name. 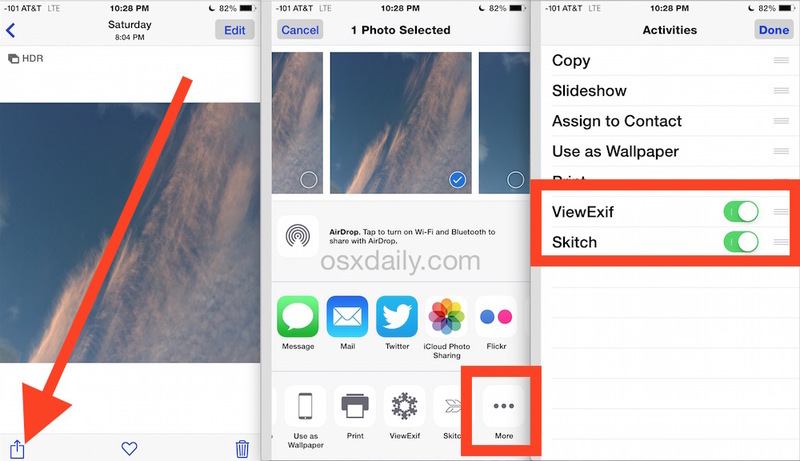 In this case, tap on “Skitch” from the Share Sheet of an image in Photos app and you’ll be able to mark it up directly with some of the Skitch functionality, right in Photos app, without having to open the Skitch app itself. As mentioned, Extensions are available with many functions and for many apps in iOS. Some of my personal favorites are for Pocket, Skitch, ViewEXIF, Dropbox, iMovie, and Camera Plus, but there’s an abundance of options out there, so explore each and check them out yourself now that you know how to enable and use them. This is one of those things that is kind of half-baked but has potential. I haven’t found one that I think is particularly great yet, and with the image editing ones I just end up going to the native app instead. To me, it’s not inconvenient to just open the app for a full feature set. Also, the Photos Extensions in iOS are so much like Photos Extensions in OS X (app), at least in theory. Extensions are a great foundation, and that will really depend on each developer implementing the right functions that play well with their companion apps. Pocket is much more elegant when saving articles from within Safari with this extensions concept. The prevailing method wasn’t so bad, while saving an article from Safari to Pocket, to simply open the bookmarks menu and use a Pocket bookmark. But the optional next step of adding a tag (while still in Safari) required typing tags out in full, a time-waster easily skipped. But I like using tags, and now the sharing extension allows you to choose from a pre-existing list of your current tags. No more trying to remember your current tags; their exact spellings — was that tag “game” or “games”? –; or pulling up the keyboard to fully type tags over and over again. And being able to easily customize the order of extensions within each app so you can put your most-used ones first is nice. Sometimes Apple can be heavy-handed when they impose only one way of doing something, but they’ve done a good job here handing control to the user. this doesn’t help when the app does not have these options available. It uses share sheet, but, only with limited apps, can’t add anything. bummer. How do I add Snapseed app to share sheet? I’m running iOS 11.